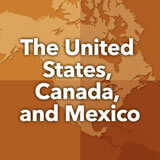 North America unit contains 16 learning experiences. Students are introduced to the U.S. Constitution, particularly the Preamble. Then they explore how the Constitution divides up government power into three branches in the United States. Next, students learn about the history of voting rights in the United States and consider the current state of voting rights. Finally, students research and compare the role of U.S. citizens with that of citizens from another country. Students are introduced to the idea that the same product has different value in different economic systems around the world. Then the student learns about the U.S. Federal Reserve System as well as the concepts of inflation and deflation. Next, students explore what it means to be a free enterprise economy and explain how the United States is a mixed economy. Finally, students create an infographic that is designed to inform younger students about the basics of the U.S. economic system. Students are introduced to American culture by watching a movie trailer in Spanish. They consider the global influence of American culture. Then they learn about various aspects of American culture, choosing one aspect and researching it to create a presentation. Finally, students predict the future cultural impacts of technology in the United States. Students are introduced to the physical geography of Mexico. They create a geographic passport of the country. Then they focus on some of the features of the country that are threatened by human influence on the environment. Students then pick one of these features that they think is important and explain why. Students explore a timeline of significant political events in the development of the Mexican government. They learn about the constitution of 1917 and the form of government created as a result. Then they compare Mexico's government to the U.S. government. Students are introduced to the economy of Mexico and focus on the history of chocolate as part of the economy, past and present. Finally, students consider what it would be like to use an agricultural product as a form of money. Students learn about two Mexican cultural expressions: the celebration of the Day of the Dead and the artist Frida Kahlo. They explore the cultural aspects of both. Then they research and share other forms of Mexican cultural expression with the group. including the North America Unit.